So DC has solicits up for their September comics, including their new zero issues. And one of them is the Green Lantern comic pictured above, with the new, so-far unnamed Green Lantern. 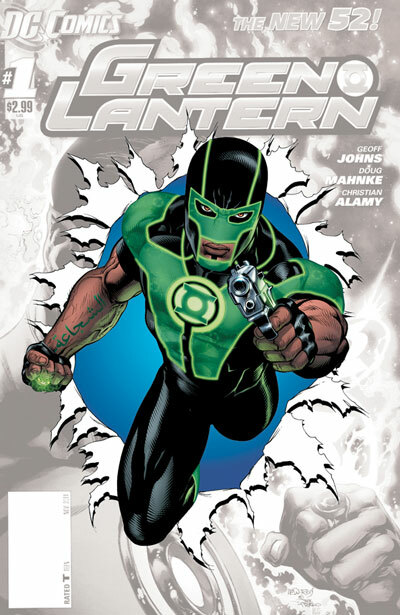 And yes, that looks like a new African-American Green Lantern wearing a ski mask and waving a gun around. Oh, Geoff Johns, your casual racism is why everyone must love you so. A few hours after that image was made public, DC said, whoa, wait a minute, he’s not black, he’s actually Muslim. So he’s still a marginalized and often despised minority wearing a ski mask and waving a gun around. Also, observant Muslims don’t have tattoos, like this guy sports on his arm. And he still looks black. So no matter what, it’s still insulting and racist! Some days, I don’t know whether the people running DC are just unusually oblivious racists (and sexists) or if they think trolling their readers and trying to get people to hate them is smart marketing. “Hey, everyone’s talking about us! Success!” Too bad your comics don’t sell so well, guys. Now how long before DC renames their “Stormwatch” comic to “Stormfront”…?